A down week, but an up month and a great quarter—maybe not a bad tradeoff. 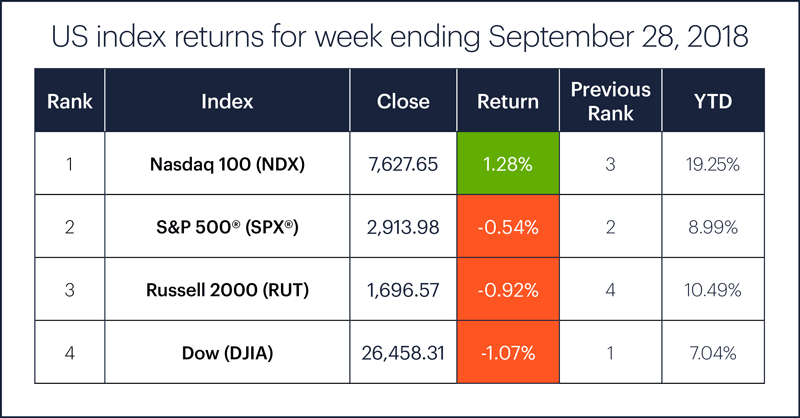 September ended the way it began—with a pullback, although last week’s downturn was much milder than the one that started the month. Although it may have looked like more downside was in store, the SPX managed to escape with a gain on Thursday despite pulling back significantly from its high. 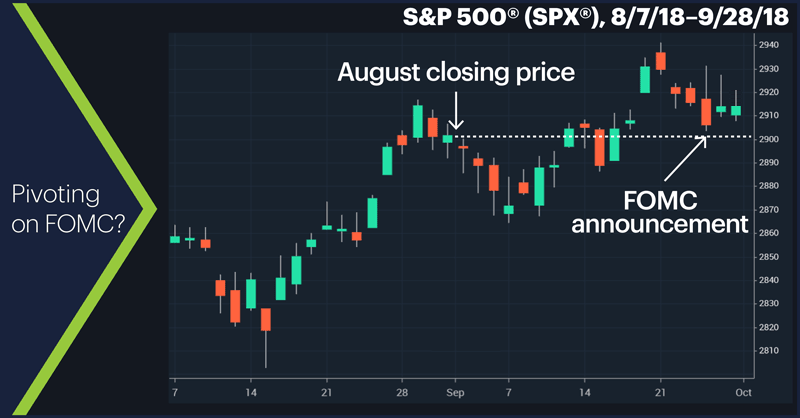 On Friday, the market appeared to be cautious pending a resolution of the Senate proceedings involving Supreme Court nominee Brett Kavanaugh, and the SPX ended the day unchanged. The Nasdaq 100 (NDX), which was the weakest US index on Friday, was the only one to notch a gain for the week. Sector action: The top-performing S&P 500 sectors last week were telecom services (+1%), health care (+0.9%), and information technology (+0.8%). The worst-performing sectors were materials (-4.5%), financials (-4.1%), and consumer staples real (-2.1%). Highlight reel: Nike (NKE) fell more than 3% intraday on Wednesday after releasing earnings, but rallied a similar amount the remainder of the week to close near its pre-earnings level. Comtech Telecommunications (CMTL) went on an even wilder ride. After hitting a new high of $36.94 on Wednesday, the stock fell more than 10% on Thursday (despite topping its headline earning numbers), but turned around and rallied nearly 11% on Friday. Futures action: After playing possum for most of last week, on Friday November WTI crude oil (CLX8) broke out to the upside, topping $73/barrel. Breakdown or bear trap? On Thursday December gold (GCZ8) broke out of its tight, nearly perfectly horizontal trading range with a down day, but immediately reversed the move on Friday to close a little below $1,200/ounce. ●Since 1928 October has been an up month for the Dow Jones Industrial Average (DJIA) 61% of the time, and has had an average return of 0.34%. ●Since 1988, October was actually the fourth-best month for the Dow in terms of average return (+1.7%), and it closed higher 67% of the time. ●Since 1998, October had the highest average return of any month (+2.49%) and closed up 75% of the time. The bottom line: Despite the nasty drops that have sometimes occurred, October has also been the launching pad of many high-momentum rallies. In short, it’s often a volatile month. But for all the pain it has occasionally caused, the traders who may have made out the best in the long run are those who saw October sell-offs as opportunities to go long rather than a reason to sell. You only have to go back to 2014 for an illustration. The Dow fell more almost 1,200 points in the first two weeks of October (a 7% loss), but then rallied more than 1,500 points (nearly 10%) in the final two weeks for a 2% gain on the month.